Shopping for a horse is fun but bring along a professional horse person (trainer, instructor or a close friend) to keep you from making any rash decisions. Are you hankering to compete in the Olympics? Learn cattle roping? Barrel racing? Carriage driving? Trail riding? How much time do you want to spend with your horse? How much money do you want to spend on a horse? I did not take time shopping for my first horse. We bought Apache because he had really soulful eyes and he was sweet. A Speckled Appaloosa gelding. I did not try him out first. I certainly did not have a veterinarian check him. Anyway, he was only $1,500.00, What a bargain! The same person was also selling a brown quarter horse mare. She (the mare) was Apaches friend so I bought her too. Apache was a very bumpy ride. That didnt matter anyway because I never rode him. He had navicular syndrome. The brown quarter horse mare turned out to be a dream horse. With big strong hooves, a lovely disposition and well schooled in both western and English riding. I was lucky to find her. Don't depend on luck to find your equine companion. A quarter horse is a great companion. Quarter horses are known for their gentle and tolerant character. They are on the most part hardy and strong. 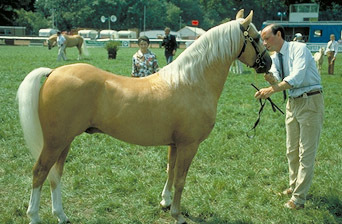 This horse's name is Chelsea Morning. My quarter horse mare is easy to ride. I can devote time to developing my riding skills instead of worrying about my safety. She knows a lot more than I do and she is kind and generous when I make a mistake. Her height and mine are compatible. She is healthy with no chronic ailments. Take time when shopping for a mare or gelding. Buying a horse is a big commitment. Please, dont fall in love. 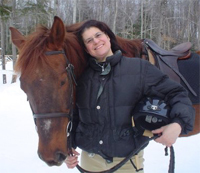 Enlist the aid of a qualified trainer or instructor.A novice rider needs help when choosing a horse. Dont go by looks - or insist on a particular breed. You might be passing up a good candidate. Soundness is extremely important. But in most cases, a horse that knows its stuff is usually mature. (Age brings experience and wisdom) and as a horse gets older some health issues might arise. This is where a qualified horse person can advise you. For example, a horse with navicular disease is not a good choice but a horse with a cribbing problem might be fine with a cribbing collar. A good tempered and patient horse is a good match for a beginner. Shopping for a horse is fun so take your time searching.  Visit stables where lessons are given.  Call trainers or instructors and inquire.  A riding school may be selling one of their horses.  Most tack shops have bulletin boards where people advertise.  Classified ads in your local paper or equestrian publication.  Take a car ride through horse country.  Lots of good horses are advertised by a handwritten sign posted at the end of driveways. Enlist the help of someone who knows a lot more about horses than you do. When you think you might have found the right horse, have a veterinarian check it for you. Avoid the heartbreak of a sick, lame or crazy horse. A farrier or blacksmith's assessment is also important. As the saying goes. No Hoof No Horse (meaning that the hooves are a very important consideration when shopping for a horse. Move From Shopping For A Horse Back To How To Buy A Horse.